From the bestselling authors of The Hell with Love, a fierce, funny, touching collection that takes the sting out of "aging while female." 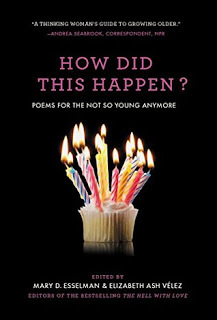 A funny little anthology of poetry that I sometimes loved and sometimes hated, but that I could entirely understand. How Did This Happen? was a funny little book. Some of the poems were amusing and profane and I loved those ones the best. I recognized some of the writers and some of the others were new to me. I could have lived without the commentary between poems because I did not enjoy it as much as the poems themselves, and I did not see what it really added to the book as the poems were strong enough on their own. Sometimes hilarious and also at times poignant, this was a great little book for anyone who is at the end of their 30s and feeling things change.